Bradford, along with husband, John, and Will Powers, will have their tent and booth for The Pastures of Rose Creek up and ready for action. Bradford said she expects to have icicle radishes and a variety of greens, carrots and “pasture- raised” eggs. John also will have wood-fired pottery he has produced during the winter. Market Manager Cindy Pritchard said she expects Bradford to have lots of company. Pritchard said she has received 30 applications for vendors who have said they will be at the Market on opening day or during the first weeks of the season. This is the second year the Market will be held in front of the courthouse in downtown Watkinsville. The Market began on the lawn of Eagle Tavern and then moved to the area behind the Tavern. Pritchard said last year’s move to the front of the courthouse was a great success. Pritchard said at the high point last year the Market had 36 vendors. Market Open From 8 a.m. To 1 p.m. The Market will open at 8 a.m. and run until 1 p.m. each Saturday until late November. The Red Oak Southern String Band, a Watkinsville-based group doing Americana, Bluegrass and folk, will be performing for opening day. Pritchard is expecting the first market to offer pies and cakes, meat and dairy products, herbs, mushrooms, peanuts, dog biscuits, honey, natural soaps and breads. 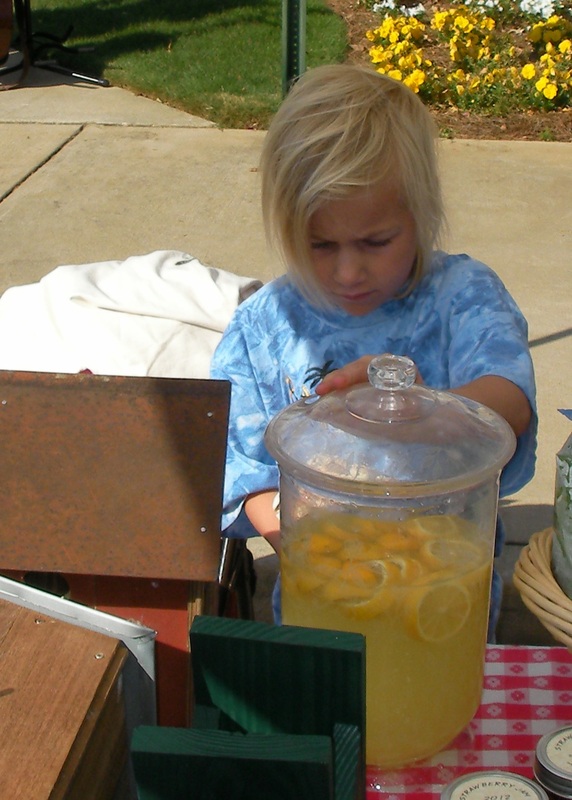 Prithcard’s daughter, Lexi, still the Market’s youngest vendor at age 8, will be selling her birdhouses, cut flowers and lemonade. Back from last year are squirrel feeders, Lexi told me. Bradford said, once the Market closed on the Saturday after Thanksgiving last year, The Pastures of Rose Creek set up its market booth on Rose Creek Drive off Colham Ferry Road to keep selling to the customers the farm had served at the Market. She said they sold beets, kale, other greens and radishes throughout much of the winter, thanks to a hoop house they built to extend the growing season. They also created what she called a “chicken house on wheels.” The movable house and grazing area allows the chickens to eat naturally and then come back to the house to lay eggs and roost. The Pastures of Rose Creek is the family farm of Powers, and the Bradfords, who met Powers in Taos, N.M., several years ago, have joined him in keeping it a working farm. Bradford said the Oconee Farmers Market has been a key element in the farming of The Pastures of Rose Creek. The Bradfords and Powers have come to count on the Market as a way of reaching their customers. Vendors agree to pay 5 percent of gross sales to the Market each Saturday or a seasonal fee of $250. Market Manager Pritchard said that about 60 percent of the vendors last year were based in Oconee County. Pritchard’s daughter Lexi, who sets up in the booth of her mother’s Seven Crows Farm, is now in her fifth year as a vendor. She handles her own merchandise and keeps her own records of sales. With her sales from last year, she told me, she traveled to St. Simons Island in February, where she had a lot of fun shopping. Unlike Bradford, Lexi said she has mixed feelings about the Market starting its 10th season on Saturday. While she will be happy to be back with the crowd at the Market, she said she has gotten used to the schedule of the off season. “I really want to sleep in,” she said.